It was sta nding room only today in the Senate Education Committee; many individuals were present to hear or provide testimony in support of or against House Bill 1241. The Office for Education Policy’s Executive Director, Sarah McKenzie, attended to present prepared testimony against HB 1241. OEP believes, as expressed in an opinion editorial earlier this year, that eliminating PARCC is premature at the current time. Chairman English, Vice Chair Lindsey, committee members: Thank you for the opportunity to give testimony on HB 1241 today. My name is Sarah McKenzie, and I will be delivering comments on behalf of myself and Professor Gary Ritter. Professor Ritter is the Faculty Director and founder of the Office for Education Policy at the University of Arkansas in Fayetteville. I am the Executive Director of the Office. 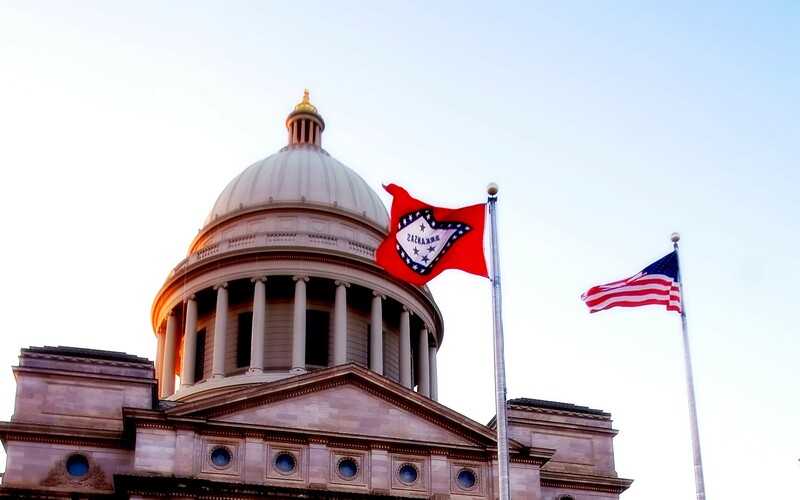 The objective of the Office for Education Policy (OEP) is to conduct research so as to provide evidence that can support state lawmakers and educators in thoughtful decision-making in PK-12 education in the State of Arkansas. Prior to my work at the OEP, I spent the past ten years working with Arkansas school districts in a variety of capacities; my PhD training is in educational statistics, and I worked with student assessment in Arkansas schools. We have developed a handout summarizing our key points that has been distributed. A lit tle note about the picture on the handout. This chalk quote by a student “loving PARCC” does not suggest that all kids love testing … of course not. But it is a reminder that many kids may and do indeed find this type of test a better experience than the prior pencil and paper tests. And the stories of students filled with anxiety near test day are mostly overblown and sometimes made up. In my experience in schools, students have far greater anxiety about teacher developed tests that lead to actual grades and affect GPA! Nevertheless, why am I here to discuss PARCC? I am here today because, like you, we at the OEP believe that all of Arkansas’ students deserve a world class education. But our state cannot ensure that our students are receiving the instruction and attention they need without administering high-quality assessments that measure their learning and provide accurate information on student achievement to parents, teachers and policymakers. Arkansas joined the Partnership for the Assessment of College and Career Readiness, or PARCC, in 2010 because many in the state believed that our existing standards and tests were not rigorous enough to prepare our students for success in college and career. In those five years, our state has spent millions of dollars and tapped the talent of our best and brightest educators to design the PARCC assessments. From writing questions to reviewing the final items and standard-setting, Arkansas teachers have always had a place at the PARCC table. Their invaluable contributions – and our considerable investments – are for nothing if House Bill 1241 is passed. PARCC tests are good tests. They may not be the perfect, but there is no doubt that these new tests are an enormous improvement over the previous Arkansas Benchmark and End-of-Course exams, which no longer match the standards being taught in our schools – standards that have been present in our classrooms since 2011. I oppose House Bill 1241 because our students should be given a chance to show what they know and can do against these higher standards, and we need to give the PARCC exams more time to prove that they can provide value to our students, parents, educators and policymakers. The eleventh-hour changes proposed in House Bill 1241 would eliminate any hope of receiving meaningful feedback on the achievement and growth of our students this year. That might placate the Common Core opposition in the short term, but it won’t improve our schools. It won’t provide students with a learning environment that best meets their individual needs. It won’t provide accountability, and it won’t facilitate comparison with other states. The only outcome that House Bill 1241 will yield is chaos and confusion – especially for our students and teachers. Our students, who face a great deal of uncertainty in how their learning and advancement will be measured, deserve thoughtful deliberation on this matter. And our educators, who have spent thousands of hours preparing and contributing to PARCC development, deserve a chance to see the fruits of their labor. Indeed, many Arkansas educators have valued the professional development work related to the Common Core and do see the standards as setting higher expectations for our students. In a recent debate in Bentonville, Arkansas, school leader Michael Poore indicated that the teachers he interacted with hoped that the Common Core would be around for a while and stated: “You’re going to have to fight to take it away from them“. A year (or not even a full year!) is simply not enough to get a full picture of the progress we’re making, and there is no reason to rush. Under the PARCC assessment, Arkansas can continue to seek input from parents, teachers and superintendents on its implementation and the use of its results. That’s all the more reason for our policymakers to engage in an unhurried evaluation of the assessments given in our schools. For these reasons, we at the UA Office for Education Policy are convinced that eliminating the PARCC tests after this year would be a step backward for Arkansas. Our educators have been seeing progress with our students since implementing the new standards, and we need modern assessment tools to measure this progress. PARCC is the assessment that has been developed, in partnership with our state leaders, to do just that. Shouldn’t we at least wait until our students actually take the exam before we declare it a failure!!?? Well said. I have dealt with the setup of PARCC assessments and, believe me, there was one point when I would have been happy to give them a toss. Nevertheless, this really is about the students and our attempts to assess what they have learned. Once the testing started, I was convinced this was the best move we could have made. Students like the tests, particularly those who experienced the booklets and long assessments associated with ACTAAP. The students from Grade 3 forward were not intimidated by the platform, could type and manuever through the tools, and felt confident about their responses. This was MUCH better than the anxiety of all the security issues, student monitoring, and small groups needed to make this work in previous years, not to mention it was simply exhausting to test for a week. Our students took one relatively small assessment each day over five days, then went back to work in their classrooms. Teachers never felt the need to rest, snack, give extra recess, or do whatever needed to keep the students coming back the next day. To call the test a failure in Arkansas is ridiculous, but to not give educators any comparable data to work with for essentially two years is malpractice. Thanks for your thoughtful response to a knee-jerk reaction. I am speaking strictly from a literacy standpoint, but I think we need to give the PARCC assessment a chance. Not a single one of my students complained about the test or the use of computers. They were on task the entire time. A tremendous amount of money has been spent on this “move”. Doesn’t it make sense that we should “live here” for a while before we decide to move somewhere else. I agree completely. Some of the CCSS are more difficult for students, and even teachers, because they call for greater metacognition that will not occur in the short term. We need to give teachers and students time to adjust to new ways of teaching and thinking before considering throwing out PARCC assessments. The new standards will do what they were designed to do and the PARCC assessment will appropriately evaluate our effectiveness as educators.